Average rating: 3.8/5 from 37 comments. - Comment-on/Rate this shop. Located in Chicago's Wicker Park neighborhood. Look for the for the multi-colored bike with spinning tires on front of building. Also Surley, Soma, and Ritchey frames available. 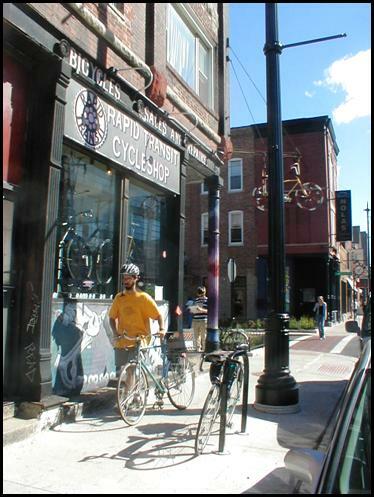 Specializes in recumbents and folding bikes of which many brands are stocked. Also a full line of accessories and parts including Chrome bags, Chariot child carriers, tag-along attachments for kids, and a selection of popular cargo trailers (from BOB, Burley, and Bykaboose). "Just about everything but roof racks & rollers, which we will happily order!" Offers bike rentals daily and weekly. Provides free workshops and seminars on topics including biking safety. Contact store for details. Website includes a classified feature where users can sell their personal goods. Rapid Transit has been a longstanding supporter of the Chicago Cycling Community and been generous with donations for raffles/door-prizes/etc. Rapid Transit promotes biking as the choice for alternative transportation, talking up biking safety and its environmental value.